2018 – Let’s get started! That’s it. I’m ready. I’ve had my Christmas break and I’m ready to get started. Let’s go! I’m excited to say that Once in a Universe will launch on Thursday 25th January, at Towner Art Gallery, Eastbourne with a talk by special guest, John Cooper, Emeritus Keeper of Natural Sciences at The Booth Museum, Brighton. John’s talk, It’s just a matter of time… will take a look at the processes of evolution by natural selection and climate change, set against the backdrop of geological time. Artist Susan Diab will chair the evening and lead a discussion following the talk, exploring how our knowledge might make us better equipped to understand the changing present and work towards a better future. I’ve worked with Susan before, when she chaired an event for my last project, The New Immortals, and look forward to the post-talk discussions which she’s so good at teasing out. 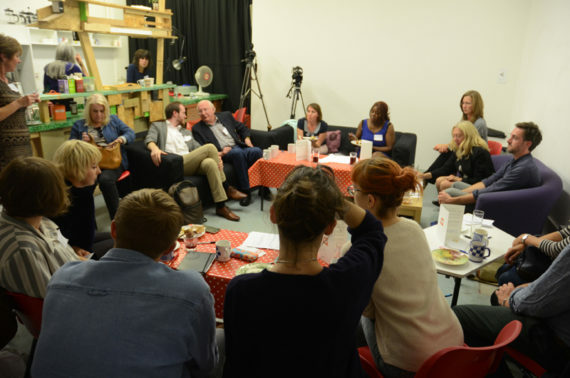 Above: Susan Diab chaired a valuable discussion event for The New Immortals in 2014. This is the first event in a series of activities which all form part of my research for this new project and I can’t wait to see where they take me. This part of the project is all about getting people talking about some of the themes I’m interested in and finding out about how people feel about the future: their hopes, expectations and concerns. In February and March I’ll be working with some exciting artists to run workshops for people of all ages at The Devonshire Collective’s DC2 and DC3 workshop spaces in Eastbourne. 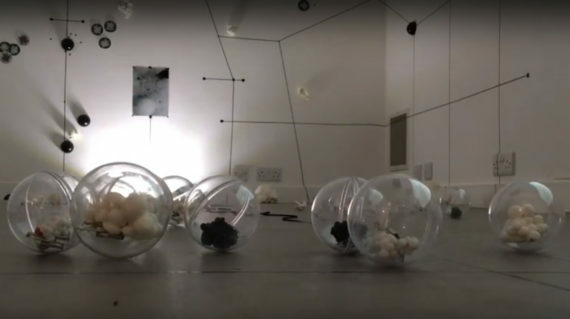 I have been working with DC Programme Manager, Amy Zamarippa Solis, and commissioning DC artists to plan events which will create opportunities for people to join in practical art-making activities as well as providing an environment where conversations can take place. I’ll be attending all the workshops as a participant so I’ll be able to work alongside members of the public and chat while we work, creating a space for all sorts of exciting things to happen that can influence the way my own work will develop. 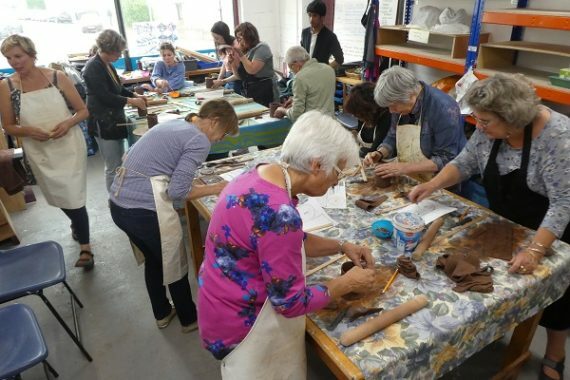 The practical events kick off with a two-part Experimental Clay Workshop for people over 65 led by artist Claire Shoosmith. I can’t wait! In March I’ll be working with Eastbourne’s Fotofonty (aka Elizabeth Doak and Maja Jones) who will be running “bring a grandparent” Cyanotype workshops for kids and an older relative, and in April, Brighton based digital artist Alex May will be running an all day video mapping workshop using his bespoke software, “Painting With Light”. 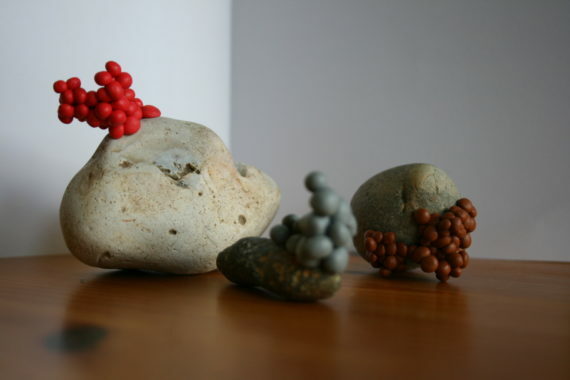 Above: work in progress in the studio, experimenting with new materials to form clumps, concretions and clusters. Once the workshops are all done, my main focus will be back to developing new work in the studio and continuing to research galleries and partners for a solo show for 2018-19. So much to look forward to for 2018 – and no knowing how things will develop. Exciting times.